NewWest FilmFest commemorates its eighth year with a three-day festival full of independent films, locally made shorts, and filmmaker presentations taking place from October 19 to 21. The festival will be held at Landmark Cinemas near the New Westminster SkyTrain station. The festival begins Friday, October 19 with Talk! at 7 pm. This documentary by local journalist George Orr explores the history of talk radio in the Lower Mainland, especially its success in the 1970s and 1980s as well as its decline in recent years. It features several familiar faces who were once talk show hosts, including former prime minister Kim Campbell and former BC premier Christy Clark. Following the screening, there will be a gala at 9 pm with Orr and former radio journalist George Garrett, who is featured in the documentary. On Saturday, October 20, NewWest FilmFest presents Truth Detectives at 7 pm and Detainee X at 9:20 pm. Truth Detectives is a documentary that explores the use of modern technology such as smartphones to capture war and crime happening around the world and bring it to the attention of others. Detainee X, directed by Toronto-based music video director Manee Osman, takes a dark look at what could happen when an American teenager’s race, religion, and interest in specific video games make him a target for surveillance and arrest. Due to the violence in the film, it is recommended for viewers aged 16 or older. “It’s not for the faint of heart, but I feel that it addresses some real concerns that I know many young people are aware of in today’s world,” Deni Loubert, a member of the NewWest FilmFest board, said to the Other Press. The festival’s last day, Sunday, October 21, begins at 3 pm with the Short Film Showcase featuring a collection of 10-minute films produced and directed by BC filmmakers. “Our short film showcase is now in its second year. It gives us a way to help film students find new audiences,” Loubert said. “One submission that was a surprise came from a high school in the Lower Mainland. It’s apparently based on a Stephen King novel,” said Dabrowski. After the showcase, the festival will screen HOPE at 5 pm. In the short documentary, director and editor Journey Smith and her friend, assistant editor Andi Wardrop, try to inspire hope in others while Smith struggles with her own disabilities. The film began as a Grade 12 final project for these Whistler students in September 2017. To finish funding the film, the filmmakers turned to Kickstarter and successfully raised $6,291 of their $4,000 funding goal during their seven-week campaign from February to April. The filmmakers will be in attendance for the screening. Following HOPE, there will be a screening for Home, a short documentary about one woman’s journey to build a safe home in Thailand for homeless children. Closing the night is Being Rachel, which chronicles a group of high school students with developmental disabilities as they create a play that shines a light on the issues they face and gives viewers the opportunity to see them for who they really are. This final documentary starts at 7 pm. “I think the positive message in Being Rachel is one that has resonance and a lot of hope in it,” Loubert said. One of the noteworthy aspects of the NewWest FilmFest is the way it has evolved from where it began as an environmental documentary festival called NewWest DocFest in 2011. 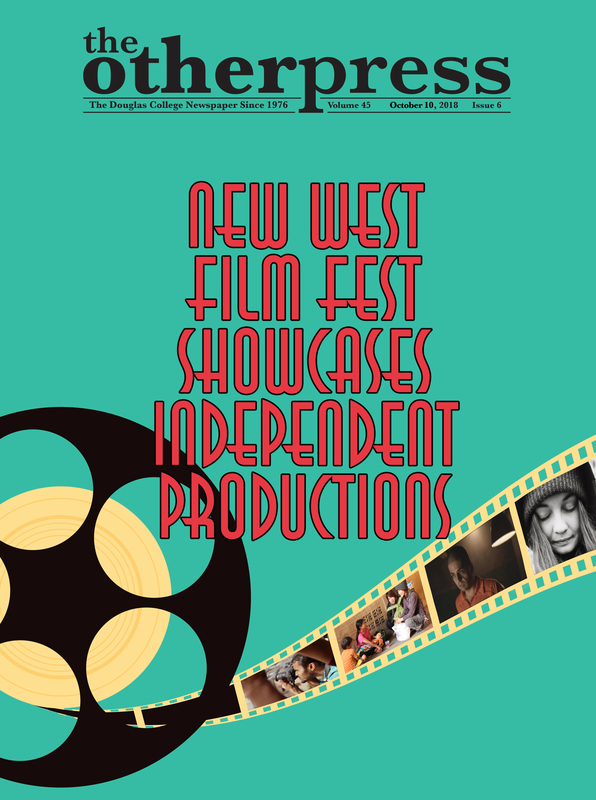 For the first and second festivals, NewWest DocFest held film screenings in the Laura C. Muir Performing Arts Theatre at the Douglas College New Westminster campus. In 2013, the festival moved to Landmark Cinemas, just down the hill from the campus at New Westminster Station. Later in 2015, the festival changed its name to NewWest FilmFest when it moved away from its focus on documentaries to include films from other genres. Despite relocating to Landmark Cinemas, the festival returned to Douglas College’s Performing Arts Theatre in 2016 to screen Viva, a film about a young Cuban man discovering his identity. The screening was arranged by Modern Languages instructor Ruth Mandujano-Lopez, who was a member of the NewWest FilmFest board at the time. She had experience bringing festival screenings to the college from her collaboration with the Vancouver Latin American Film Festival, which had screened its films at the college since 2013 and provided Viva for the NewWest festival. Although not returning to Douglas College for a screening this year, NewWest FilmFest is returning to its roots with several documentaries in the lineup including Talk!, Truth Detectives, HOPE, Home, and Being Rachel. According to the organizers, the 2018 festival also boasts an impressive number of submissions from which the films to be screened were chosen. “This is our first year where all the films we will be showing are a result of a direct call for submissions,” Loubert said. “We got over 3,000 submissions from 83 countries,” Dabrowski said. NewWest FilmFest members volunteered to watch, critique, and review the submitted films over an eight-month period in order to select the films for this year’s festival, according to Dabrowski. The documentaries garnered a lot of positive feedback, which led to their inclusion in the festival. “We’ve also got 20 to 30 other really good films we’re keeping in reserve for some other time,” Dabrowski said. For more information on the three-day festival’s films and showtimes, check out NewWestFilmFest.ca. Tickets are available online at NWFF2018.EventBrite.ca. Single tickets are $10 each for adults and $7 each for students and seniors. Festival passes are $50 each, with a discounted rate of $40 each for early birds, students, and seniors. A one-time membership fee of $1 is required and will last for the duration of the festival. “I think that attendees will experience a varied festival this year with some outstanding work from a variety of indie filmmakers,” Loubert said.